Move over rice! This recipe for shrimp fried farro is a delicious new spin on an old stir-fry favorite, with a poached egg on top for good measure. This super-simple recipe for shrimp fried farro is the result of one of my hard and fast kitchen rules, which is this: whenever you make something that can be repurposed into another recipe, MAKE EXTRA. Extra buttermilk rosemary grilled chicken turns into chicken soup the next day. Extra grilled steak turns into perfect steak Caesar salad later in the week. And extra nutty, chewy, gorgeous farro that you made for farro tomato salad turns into lickety-split shrimp fried farro. 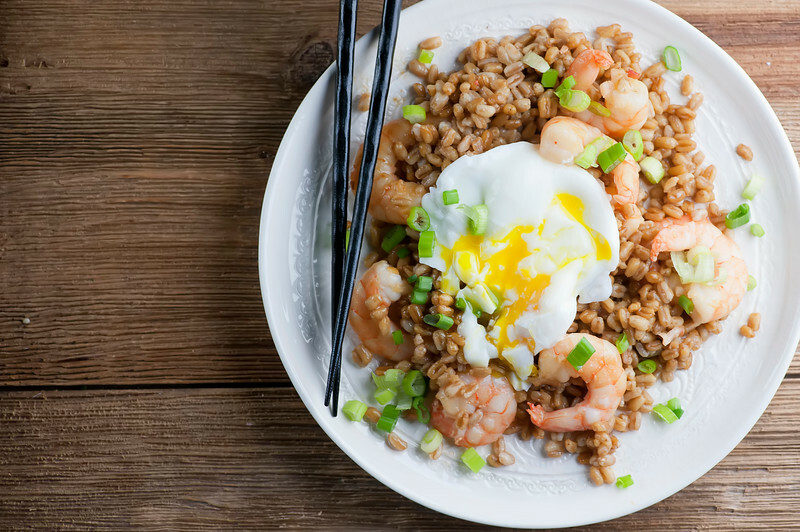 It’s got the same things you love about shrimp fried rice, except the egg is poached instead of scrambled, the shrimp is whole instead of chopped, and the rice is, well, farro. 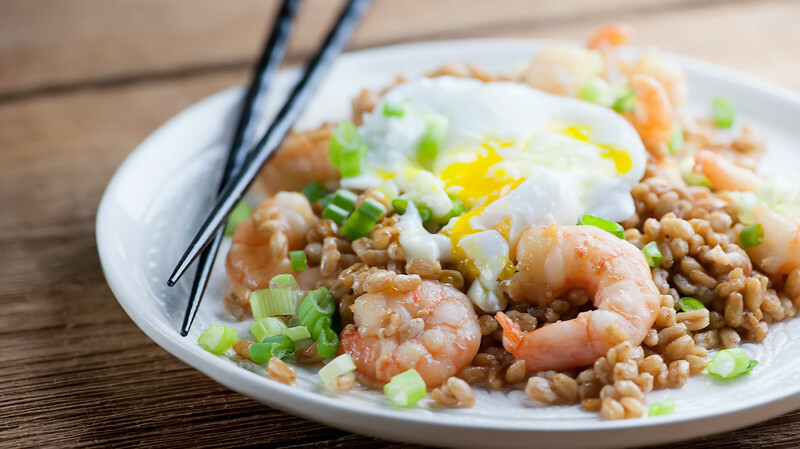 Because while shrimp fried rice is a beautiful thing, it’s also fun to shake things up now and then, don’t you think? Let’s make it! 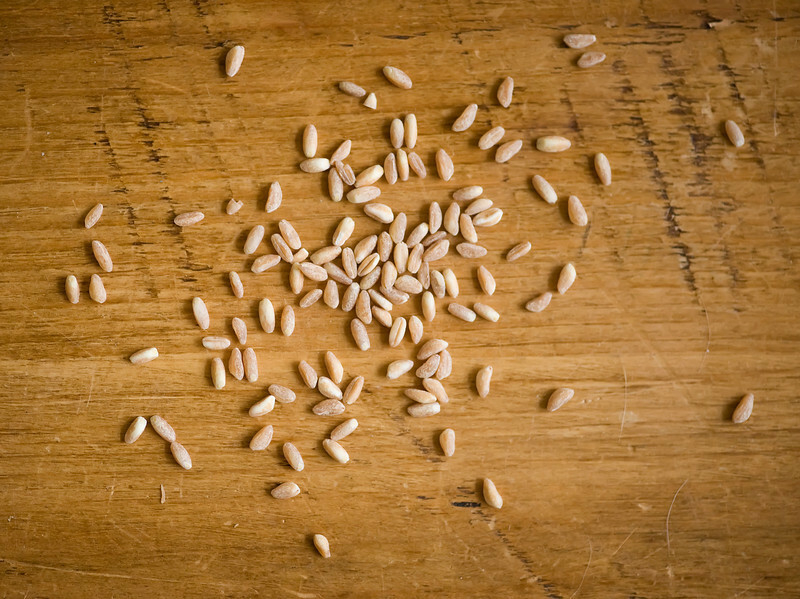 If you have yet to discover the deliciousness that is farro, let me be the first to tell you that you NEED to try it if you haven’t already. 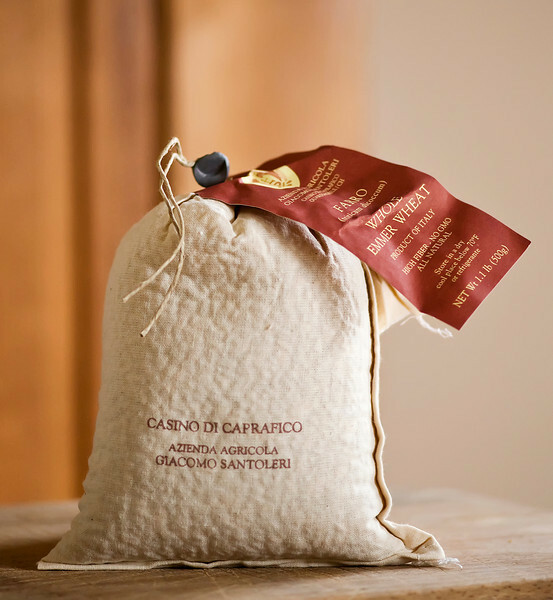 I used to have to hunt for it in Italian specialty stores, where I would find it in exotic looking little bags that I felt a little guilty about snipping open because they were so pretty. But now it’s in my regular old grocery store right next to the rice and the barley. And speaking of rice and barley, farro is in the same general category, except it is a little more sassy. It’s got a nutty, chewy, delectable flavor that I am addicted to. Which is why I make extra, which is how I ended up with shrimp fried farro for dinner one night. I sautéed some nice big shrimp in a little vegetable oil with some chopped garlic and ginger. Then I added in some soy sauce, a little sesame oil and some rice vinegar, and the cooked farro and stirred it all around until the farro was hot and coated with all the other deliciousness in the pan. Meantime I had some eggs poaching on the other side of the stove (click here for my fool-proof method for poaching eggs!). When everything was done, I scooped some farro and shrimp onto each plate, topped it with a poached egg and a handful of chopped scallions, and cut into the egg so the creamy yolk could melt into everything. Heat vegetable oil over medium high heat in large deep skillet. Add ginger and stir for a few seconds. Add shrimp and cook through, about 2-3 minutes. Add farro, then soy sauce, sesame oil and rice vinegar. Stir until well combined and heated through. Meantime, poach the eggs (or fry them if you like that method). When everything is done, divide shrimp and farro among plates. Top each with an egg and scatter scallions on top. Serve immediately. Be very happy you made extra farro. Recipe updated from an earlier Framed Cooks post! I love posts like these – who says a classic can’t be reinvented?! I use farro quite often too. Taking suggestions? Haha I’d like to recreate desserts! I like your motto….make extra! It’s a great way to get great homemade food without spending all the time needed everyday. I need to do more with farro. It’s a grain that I often overlook. Oh, farro is the BEST! What a fun way to use farro! I love the shrimp in here, sounds delish! Farro and shrimp are one of my favorite combos! Haha, totally agree that farro is more sassy! I love it’s texture and I love the way you used it here! All about some re-made classics, especially when they are super easy and can be remade with extras from another meal :) Pinned! Thanks for the pin, Kathryn! And yes – THAT TEXTURE. My fave! You 1000% deserve this for breakfast my friend! Farro Forever! This looks so tasty! Thanks for the share! I am inspired by the way you cook. This recipe sounds great.Kate !! Farro has been on my list of grains to try, and I think doing it like fried rice is so brilliant. I want to give this a shot! As always, you are the queen of creative meals. I wish I had your ability to just look at something and imagine it as something totally cool! So true! I love having extra leftover for making another dish. I especially love making arancini with leftover risotto….they are almost better than the original dish :) This recipe looks delicious. Total comfort food in my opinion, especially with that egg over top! Love how easy it is to put together too! !